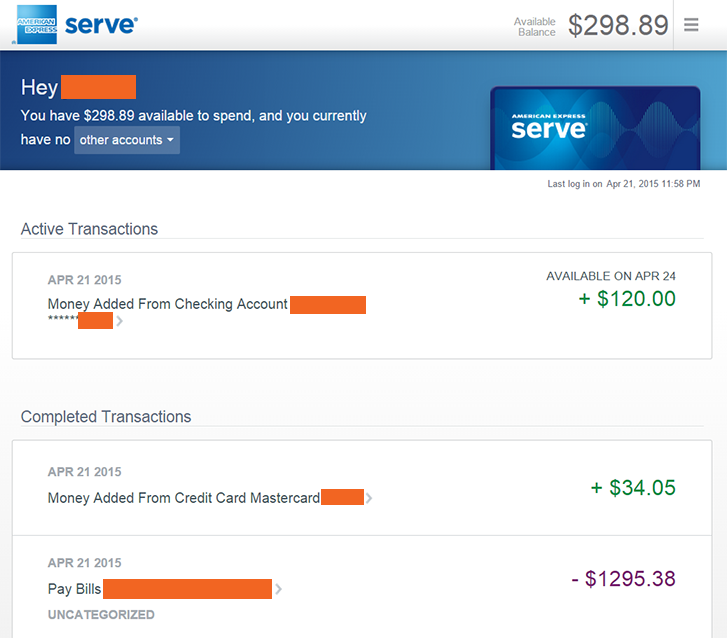 Amex Serve Credit Card Loads Still Possible After April 15? I logged into my Serve account the other day to do a bill pay and to my surprise, the option to load from my Citi Double Cash Mastercard was back. If you remember, Serve announced that after April 15, 2015, they would be ending credit card loads from Visa, Mastercard, and Discover. I had checked on the 16th and sure enough the option was gone but it seems like Serve has placed the option back for the time being. I did a test load and it went through! I went to the green "Add Money" button and there is a clickable link titled "Change Source" which allows me to select either my bank account or my credit card for the load. It may be important to note that I was a Softcard signup and I kept my card tied to my account after April 15. I’m not sure how long this will stick around but since I do not yet have the Fidelity Amex, this is good news for me. 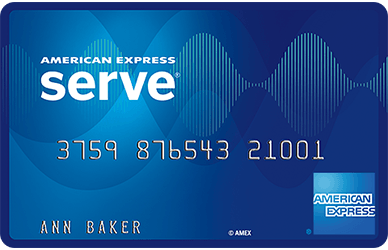 The Fidelity Amex is a third party card that uses the American Express network which should still work for the 2% cash back using Serve. You can see from the screenshot below that the Mastercard load is dated April 21th. Is Three Years The Most Optimal Age To Buy Used Cars? Buying used cars is a very good way to reduce your transportation expense which is one of your average person’s largest expenses in their lifetime along with housing and insurance. However, there are some pitfalls of buying used cars that can eliminate any benefit of buying used, including hidden problems and poor prior owner maintenance. Owner maintenance can be remedied by asking for service records. An owner that keeps copies of oil change intervals and other maintenance work are more likely to have taken better care of their car versus someone that does not. For the average person that just wants to buy a car without hidden problems or repairs, the best strategy is to buy a 3 year old used car. The reason for this is because most factory warranties are 5 years and 60,000 miles. That means when you buy the car, it should still have about 1-2 years and 15,000 - 20,000 miles left on the factory warranty. Any major issues with the powertrain, such as the transmission or engine, will be covered. More importantly, the prior owners will also have had this warranty so any problems that arose would have been taken care of, thus the amount of deferred maintenance will be minimal. Note that you should not be worried about things such as tires or brakes, which are normal wear and tear items that should be replaced regularly. However, if you notice the tire treads are just about gone, you can often use that to bargain for a lower price because they will need to be replace soon. By buying a 3 year old car, the previous owner will have taken most of the new car depreciation hit for you. 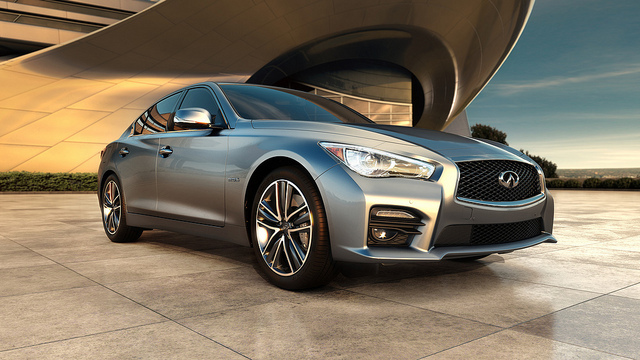 There will be a good selection of inventory to choose from because the majority of lease periods are for 3 years. As far as brands go, you can’t go wrong with Honda or Toyota. Hyundai and KIA are also good options because their Certified Pre Owned (CPO) vehicles retain their 10 year, 100,000 mile warranty, whereas non-CPO used Hyundais and KIAs only have a 5 year, 60,000 mile second owner warranty. If you are a savvy consumer, you probably have many accounts at different financial institutions, each one serving a purpose best suited for its features. Alliant Credit Union at first glance does not have the highest savings rate nor the highest checking rate but it is still worthwhile to have an account there? Alliant's interest checking is 0.65% (as of 4/21/2015) but the biggest advantage is the easy requirements to qualify for that rate, just one deposit a month from a wide variety of sources. Straight from Alliant's website they state that the electronic deposit "can be a direct deposit, payroll deposit, ATM deposit, mobile deposit or transfer from another financial institution." This is in contrast to other accounts that require 10 debit card purchases or direct deposit requirements. There is also no minimum balance requirements to maintain. If you're someone that wants a simple checking account with a very decent interest rate, Alliant is worth a look. Alliant's savings account interest rate is 0.9% (as of 4/21/2015), not too far from the popular Ally bank's 0.99%. However, Alliant's checking product is much better than Ally's. Ally requires a minimum balance of 15,000 to qualify for their 0.6% interest checking. Perhaps Alliant's biggest advantage is their ACH system which allows free inbound and outbound transfers with the fastest transfer times among its competitors. If you have many accounts at different banks, this feature is a must have to quickly move funds around. If you regularly deposit cash, a popular option is to pair a mostly online bank like Alliant or Ally with a bank that has local branches. I use TD Bank's Convenience Checking which has a $100 minimum balance requirement to waive the monthly fee. This works out well for me because I prefer a bank with many branches throughout my area and TD Bank is in literally every city in New England. You could just as easily open an account with your local credit union and most of them will have free checking. At the end of the day, Alliant doesn't excel at any one thing but the combination of all their above average products and easy requirements makes it a worthwhile bank to have. They are offering a $50 signup bonus for new High Rate Checking accounts (their official name for the interest checking account) with promo code CNM. Amazon recently introduced a new rewards program for their Amazon Prime Store Card which gives 5% back as statement credit or 0% interest on purchases over $149. It looks like you must be an Amazon Prime member to take advantage of this offer which does lower its value somewhat for a lot of people. The Sallie Mae MasterCard also offers 5% cash back on Amazon purchases up to $750 per month. The new Amazon Store Card is worth having if you are hitting that limit each month. People who spend that much per month most likely already have Prime so this card is really targeted towards power users. As another incentive, Amazon is offering a $40 Amazon gift card as a bonus when you sign up using the link. Welcome to the ProfitScene Finance Blog! Recently I found myself spending more and more time reading and researching financial topics. I was reading about everything from investing, credit cards, real estate, loans and mortgages to credit reports. I’m not sure where this fervor came from but I found myself wanting to discuss some of these things. My family and friends however are fairly conservative and did not share the same newfound enthusiasm I had. So I decided to start a blog. I can now share my findings with anyone who wanted to listen. Finance is a wide topic but I hope I will be able to provide interesting viewpoints about the financial landscape.